Reverb is one of the oldest tools we have as engineers to enhance our recordings. But how do we use it? What type should we use? Can YOU hear the difference? How to add a sense of height to your mixes with hall reverbs. A classic Hardware PCM 70 Chamber next to a plug-in Chamber. Learn how to hear the characteristics of these classic sounds, from Fab Dupont. Only on pureMix.net. 09:34 - Which Plugin Should I Use? 25:16 - What Would Fab Do? Good morning, children! Welcome to the third installment to the How To Listen series; How To Listen: Reverb Edition. Let's go! Reverbs are hard because you really can't tell what a mixer used by listening to a finished record. It's difficult. Sometimes, you know, there's a break, and there's a long tail, and you can kind of identify the tail of it, but most of the time it's really guesswork. So what I propose we do is listen to a bunch of different kinds of reverbs and I'm going to point out to you the important things so you can learn to recognize the different colors, and then we'll apply that to a vocal, you know, in the context of a song, and look at the differences of vibes and blending that they do, and then you can go from there. The first step is to listen to the different kinds of reverb. I have here a TMBOY song called "The Light." I'm going to solo the vocal on the verse, and this is the vocal super-dry. You can hear the bleed of the bass drum from the headphones. I want to turn on a Plate, and I'm using an EMT Plate. Do you hear that tail? You can hear the slightly metallic quality of it. Not metallic as in annoying metallic, but metallic as in kind of like a lush, big piece of matter just vibrating. Listen also to the early reflections; basically what happens just as the vocal gets into the reverb, the blooming at the beginning. Do you hear that "On" part? So, do you hear that? That sounds great. I don't know why. That's the one I usually like. Let me compare it with the real Plate. I have a real Plate. So this is the EMT. The tail is a little longer, maybe I'll make this one a little longer. And also, it's a little fatter, so I'll remove the high-pass on the plug-in. Again, this is the real Plate. The UA Plate is pretty badass, eh? You just heard it against the real thing. So, either way, real or plug-in, you can hear that it basically gives you a really nice bloom right after the vocal, and then a bit of a tail that thins out and is very smooth. Now, let's listen to a Spring. In this case I have the PSP Nexcellence. Listen very carefully to what's going on at the beginning of the blooming of the reverb. Did you hear that? Again. Very nice! So you get a thin bloom, but a denser bloom. Check it out. This is the Plate. It's a little shorter, but what's important is the density of it. In the sauce, the differences between the different types of reverb will be, you know, fading out rapidly, but the early reflection type of it is what really matters, so check out the early reflection again of this PSP Spring. Hear "On that..." Let's listen to that. I'll compare it with a real BX10. A little denser but a little fuzzier. Check out the tail. Do you hear that? That is very characteristic of a Spring. Smoother. This smoothed it out, so this actually could be useful. So if you want something dirtier maybe you want to find yourself a BX10, and if you want something that blends better, the Nexcellence is great. So that was a Spring reverb. Let's listen to a Hall. I'm using the Space Hall and I'm using this really good IR. I thought it was really nice. Check it out. That really sounds like a Hall. It's a really good IR. What's interesting with Halls is instead of being just tail, like, there's a little bit of a height quality to it, right? I'll compare the Hall with the Plate. So the early reflection of the Hall actually gives you a certain height feeling. They're not surrounding the vocal, they're more kind of airy above the vocal, which is great. Let's compare this IR of the Hall with an algorithmic Hall by these lovely people at Valhalla. You'll notice that it doesn't really sound as natural a Hall as an IR. But, it's nice and airy and useful. The tail is a little shorter. Let's shorten this down a little further and see what happens. Let's listen to this in the track with a little more Returns, because as you noticed, when we play the track, the reverb kind of gets sponged-up by the rest of the track. So, this is why you should always set up your reverbs in the track, but that's not the discussion here, we're just listening. The Hall as an IR. Right now I like the IR better, right? You hear the fact that the algorithmic one sounds a little thicker and everything, and this is where the can of worms opens because you can change that. Say, I could high-pass the Return here, I'll use the Low Cut, and now it sounds like this. They are now a lot closer to each other. Let's listen in solo again. One tweak and they get a lot closer, and now, with five minutes of tweaking I can make one sound like the other or close enough for jazz considering it's going to be in the sauce and nobody will hear the difference, and that is the key here. There's a lot of talk about, "Oh, man! This reverb plug-in is bananas, and that reverb plug-in is special, and you got to buy a Bricasti, and you..." They all have their value, they all do something great, but if you know what you're listening for you should be able to create the sound you want. That's what makes a difference, meaning, I have a Hall that's kind of airy, like this — not hairy, airy — and then I have a Plate that gives me kind of a tail and a surrounding place around the vocal. you know, you can hear a fly fart from the other side of the room, but apart from that situation, when you're making a record that has a lot of density, it doesn't really matter what the plug-in is as long as it's good quality. 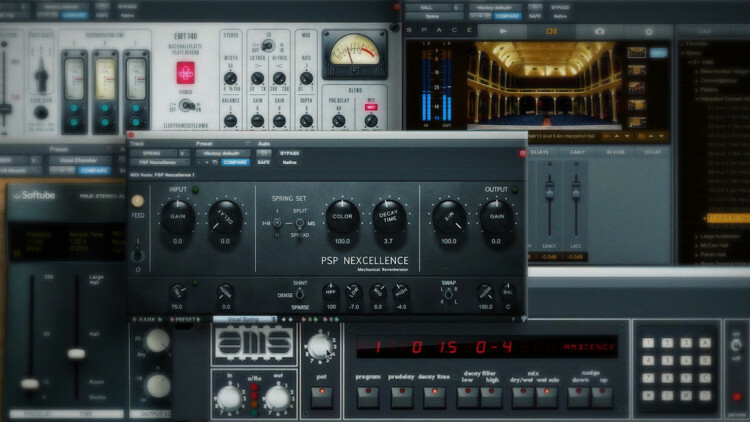 And these days, most plug-ins are really, really good quality, so what matters is that you learn the different types so that when you put the reverb on you're already putting the reverb that you think you're going to need to create the space that you want. The idea here is to learn the different colors. So we've seen a Plate, we've seen a Spring, which has the biggest sonic imprint, and we've seen the Hall. Now let's look at what people call Chambers, or also, Rooms. A Room or a Chamber is the same thing. What made Chambers really popular is partly Capitol's Studio A in LA where all those Chambers were used for all those classic records, and also the fact that Lexicon came up with a really good Chamber algorithm on their 480s and then all the subsequent ones like the PCM 70, for example. So let's listen to what a Chamber sounds like, or what a Room sounds like. Here I'm using the Softube reverb, this small one. I like it, it's great, and it's very nimble on DSP. Let's not forget that a Hall is a big room, so the reason why they are different algorithms is because of the early reflections. The early reflections in a small room are very different from the early reflections in a big room, and that's what those plug-ins are trying to recreate or those IRs are trying to capture. Listen to the early reflection — what's right after the vocal — on this algorithm. Let's compare it with the Hall. Same family, just a lot closer on the Room, and brighter too, right? More early reflections. By the way, for comparison, I have here a PCM 70 with the classic Lexicon Chamber. It's in the loop, so you can hear the actual PCM 70. So listen to just the tail. Slightly different, but not that far away. If I play it in the track, you won't be able to tell the difference between the two. That is a Room, so let's compare a Room to, for example, a Plate. Obviously, the length gives it away. Here is the Room, or Chamber. Close cousins, right? Those early reflections. The tail is the difference here and the slightly more ringy quality of the Spring, but it's not a night and day thing. Obviously, the designers who came up with the Spring reverbs or the Plate reverbs were trying to recreate the real thing so you didn't have to have a chamber or you didn't have to have a hall if you wanted to work in post. So clearly, the Spring reverb, for example, is trying to recreate the feeling of the Room in this case, and it's pretty close. It's not perfect because you have physical limitations, but it's pretty close. Is it night and day? No. Now, if we're talking about a Spring reverb on a Fender amp, that's a whole different thing. That's an effect. That's cool too, but here we are talking about reverbs that are trying to be "room-like," or natural. Let's listen to the Ambience. Let me remind you what it sounds like dry. Sometimes it's called the 'Office', sometimes I use very short delays. It's basically almost all early reflections blending into each other to create a space. Kind of like a very short Room, but a certain intimacy on the vocal. It removes that rough edge of having nothing in between the notes, but it doesn't give you any garbage or any tail. That Ambience algorithm is really practical to be able to fill the holes in between two notes on an instrument, a vocal, or whatever, but not add any tail garbage or any heavy stuff that you have to pull on and try an EQ or do things. It's just very discrete, which is why when it showed up on the Lexicon reverbs in the '80s, I think, early '80s, it became very popular. It's also available on the AMS. In my taste, the one on the AMS is a little bright. I will show you. It's a little bright and a little digital. However, it is the sound of 1983. So, this is the ReVibe II. It really sounds like a Lexicon to me. Let me get the AMS. And UA did a badass job at making it sound exactly the same as my AMS. It's just, I am not a fan of that algorithm for myself unless I'm trying to do, you know, a Thomas Dolby-style record. Close enough for rock 'n' roll. You know what? I think the plug-in sounds better than my actual hardware reverb. Let's listen to it in the context. In the context, I miss the bloom of the ReVibe II. Check it out in the track. A reminder. This is dry. "On that day..." Listen to that. It doesn't have the same sugar to go around the vocal. I'll play it again. First, the ReVibe II. That doesn't feel the same. The ReVibe II, which is a really good emulation of the Lexicon, to me, that's more what the Ambience algorithm became very famous for. Now, let's recap. I'm only going to use the first choices. I'm not going to use the alternates — those were for entertainment. Quiz time! I'm going to play all five reverbs. I will not trick you. I promise! You'll have to figure out which is which. There's a number over every example. Associate a number with the reverb. Have fun! Here we go! Got it? Are you sure? Ready for the answer? We're not putting the answer in the video so that you keep listening until you're 100% sure that you got it and internalized the sound of all those different reverbs. Let's talk about pre-delay for a second. A lot of reverb plug-ins and some hardware rackmount reverbs have a pre-delay setting. What is the pre-delay? Back in the day, before the boxes had enough processing power to recreate real early reflections, or at least real-sounding early reflections, what the designers did is they included a pre-delay, meaning you could delay the reverb. Instead of the reverb starting to bloom right when you send signal to it, you could delay that bloom and thus creating the illusion of size, right? Because if you're in a hall, a big room, it's going to take longer for the early reflections to get to your ears than if you're in a small room. That actually creates the sound of the room. Not the tail, the early reflections. So the idea was, "Well, if we have a digital reverb, and it takes a while for the reverb to happen, then it would feel like the room is bigger and you'll get more of an illusion of space." Did it work? [High-pitched mumbling] For debate. However, it is nice to be able to push the reverb back. Sometimes you can feel that the reverb crowds the vocal a little bit. Check it out with the Plate. Do you hear how it's very tight? It's pretty. What happens if I push it back, like, 70, or 100 milliseconds? Do you notice how "On that day" it doesn't slap against the vocal the same way? Check it out. I went a little too far. Here. It's useful, especially if you have a lot of reverb, like if you're making a new Enya record or something. And it's nice to be able to push the reverb back a little bit so there is not so much on it. I don't use pre-delays a lot, but I hear it a lot in records because of mixers being used to the old boxes. With plug-ins like, for example, the Oxford plug-in, or a lot of the modern reverb plug-ins that are not trying to imitate an old box — the modern, clean reverb plug-ins — they have early reflections, so the pre-delay is really kind of irrelevant unless you're trying to recreate the effect of the designer not having early reflections and trying to recreate the early reflections with the pre-delay, but that gets a little deep. So let's listen to the Plate with very short pre-delay and long pre-delay in the sauce. Check it out! Listen to the word "In that eve..." So when she leans into that "In" word, the reverb comes really quickly and bunches up a little bit. So, in this particular case, if this reverb was only used for this vocal, it would be kind of elegant to push it back a little bit and not have that crowding, and not have the vocal feel dry because if the vocal is dry, it sounds like this. And that is the fun part because with reverbs you can really, really decide the vibe and the tone of the track and the direction, and even the style of the track based on the reverb. Will there be a big difference between a Plate and a Hall? It depends how much of it you use. If I use a lot of Hall, like this, check it out. Versus a lot of Plate. We're entering the realm of taste, which is a beautiful thing. What would I do for this particular track? Well, I don't remember what I did for the record, and I know this is us listening on the video, but, you know what? It's here, and the song is awesome, and she sounds great. What I would do is I would probably have a little bit of the tail, but not this fat. I would probably high-pass it. And then I would have a little bit of Hall for height, and then I would add some Ambience, and try and blend those three things. A bit much for me. Hear this. We might even high-pass further on the Plate so you don't hear it as much. I'm happy with this right now. It may change depending on the mood, and if the artist comes in and says, "You know? I want it to sound more like..." — I don't know. With this bass... — "...New Order," then I would have to go with something very cold and kind of long and very obviously reverbery. Or if they say, "We want it bone-dry with just a little bit of ambience," which I kind of like, check this out! This is awesome. For this, this has a lot of attitude. EMT, or maybe a dynamic EMT coming in from time to time, or something. I don't know, but I like the attitude of the dry thing. What matters now is you know the difference between a Hall and a Plate and a Chamber/Room and an Ambience and a Spring, and you can tell with your eyes closed without looking at the plug-in, and that is awesome! Et voilà! Yes! Now I know the difference and I can chose the right one. Thanks Fab! The best reverb lesson I took so far! Thank you Fab! !Cheers from Brasil! This tutorial helped me so much that my numbers coincide with the numbers on the description. Thank you fab. Regards. I love the "How to listen" Series, that's what makes me progress the most, un grand merci a toi Fab ! I don't know Fab? I'm so spoiled by actual plates. There is a density, I hear, from a plate. That is unparalleled with that of anything digital. Most of these reverbs, you're demonstrating, sound like mud. Hi pass filtered mud. Is still, mud. And hey. We heard the AKG BX-10. What the hell happened to my, BX-20 E? What? Not good enough for you? Maybe too good? Maybe right or left channel still funky? I mean you rebuilt my Neve, console. You didn't fix the BX-20 E? Damn! Well... that's muddy, also. In comparison in any plate. Yeah that pre-delay on your fake EMT, most definitely works better. Absolutely amazing, what I’ve been looking for, thank you Fab du pont, you are a legend, love sent your way from Scotland. Excellent tutorial as always Fab, great stuff! Thank you! Thanks, Fab.The best video of audio teaching. Thanks, Fab to create a series of "How to listen" very useful! great lesson, just straight to the point!! Awesome ! Super helpful . Really helpful, great explanation. Chapter Quiz is great as well, because i guess right my reverb favorites chamber, plate and ambience ;) Please don't forget german subtitles, would be fine ! This is a great video, very helpful. Thank you! These videos are super helpful, thanks Fab! Thank you for this great video. 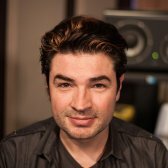 What about FabFilter Pro R where they don't care about giving us the type of reverb (mostly) ? Why ? Also there is no reveal button on the page right now. Cheers.